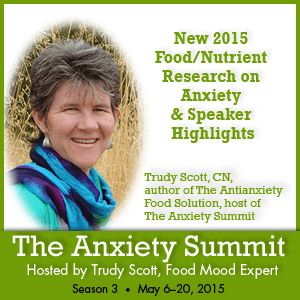 The host of the Anxiety Summit, Trudy Scott, Food Mood Expert and Nutritionist, author of The Antianxiety Food Solution opens up the Anxiety Summit Season 3. What if nutrients could treat mental illness? “Nutritional Medicine as Mainstream in Psychiatry” published in January this year. We are at a tipping point in psychiatry. The growing body of literature on the effect of nutrients on mental health is compelling enough and consistent enough for us to pay attention. It is time to revisit the role of diet and supplementary nutrients in the treatment of mental illness and to invest in this line of research. Here are 2014 dietary guidelines of Brazil What is your takeaway? who will you teach to cook? Will you take cooking lessons? Will you plan more family sit-down meals? Here is the information on Preschoolers on Medicaid being prescribed psychotropic drugs – very disturbing and sad! And here are all the speakers of Season 3 of The Anxiety Summit. There are some fantastic talks on this summit and I will share my favorites! 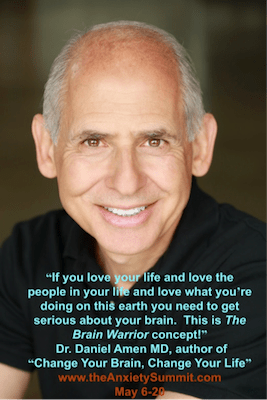 This one is by Dr Daniel Amen and is from Trudy Scott’s blog. Why we are in a war for the health of our brains? There is a path to keep your brain much healthier than most people every thought possible! Neurons don’t age, it’s blood vessels that age and if you understand that and can keep the blood flow to your brain healthy, it directly attacks ADD, anxiety, depression, obesity and Alzheimer’s disease. And a great sense of humor too! We had many laugh out loud moments which are always good for us but especially great when we’re feeling sad, anxious or overwhelmed. We talk about how important the microbiome and gut health is when it comes to mental health. He finds it funny that as the brain doctor, he now going to have to consider poop! He really does say that! The marked difference in the rates of serotonin synthesis between male and female subjects is, to our knowledge, a new finding. Moreover, no differences have been found between the number of serotonin re-uptake sites in the brains of male and female subjects. The rate of serotonin synthesis will depend on numerous factors including the free plasma tryptophan levels, the plasma levels of tryptophan relative to the other large neutral amino acids, the activity of the system that transports the large neutral amino acids into brain, the gene expression of tryptophan hydroxylase, degradation of tryptophan hydroxylase, compartmentalization of tryptophan and tryptophan hydroxylase in brain cells, as well as probably numerous other factors. 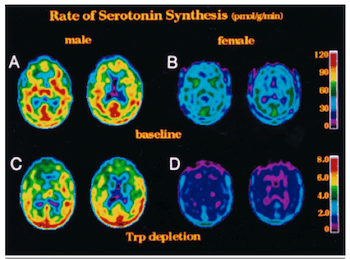 Averaging over the different brain areas, the rate of serotonin synthesis is 52% greater in male than in female subjects. This is one of the largest differences between the brains of males and females that is not related to hormone binding sites. The reason for this difference is not clear at this time. Here is an image of brain scans that were published in the above study. The color bar on the right in the same row gives an indication of synthesis i.e. blues, purples and pinks means low synthesis of serotonin. The research found low synthesis of serotonin in the women in the study. We can tie this all back to the gut since we make so much serotonin in the gut!